We are so excited to finally announce a project we have been working on since May! Bird Closet is a collective of young people in Bethel that developed organically from the relationships we established as part of SOIL SERIES. 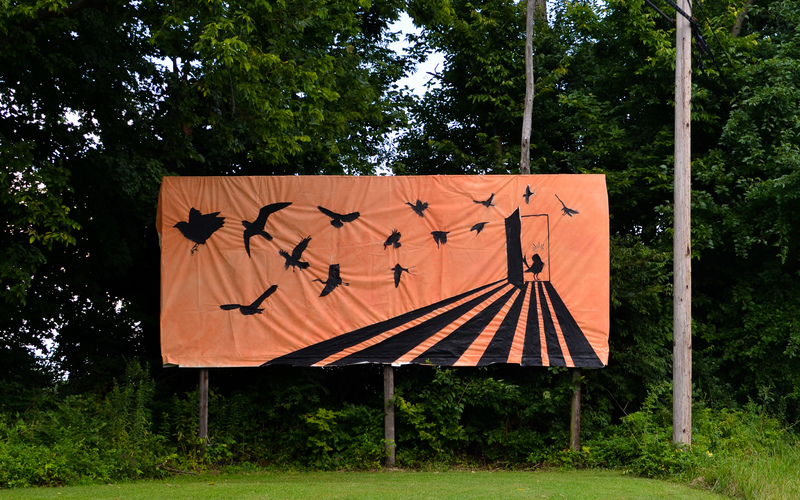 In Bird Closet, teens who have played integral roles in the evolution of SOIL SERIES become artists in their own right, working in horizontal collaboration with one another and with SOIL SERIES’s founding artists to create works that excavate Bethel’s past and use this history as material for the creation of a new future. Bird Closet is distinguished by its playful, prankish nature, with output ranging from collages and billboards to bird masks, alter egos, and a rich self-mythology. By conjuring an alternative universe, Bird Closet creates a parallel space in which the artists are free to pursue creative and social projects that may seem otherwise untenable in the world as it exists. Far from escapist, the works of Bird Closet are meant to intervene on material reality and inspire similar explorations by other residents of the area and beyond. We are especially excited to announce Bird Closet’s upcoming exhibition at Mount Vernon Nazarene University‘s Schnormeier Gallery, August 27th – September 28th, 2018 with a gallery talk on September 7th at 5pm and an opening reception on September 7th, 6 – 9pm. More details below! We first considered the idea of founding an art collective during our trip to New York last November. Reflecting on what SOIL SERIES had accomplished so far, we were most excited by the strong bonds we had formed with the Empower Youth interns while renovating the Barn Studio. Social drawing is about developing relationships, which in turn create the conditions necessary for new and radical possibilities. That is why when our former professor, Lydia Matthews, suggested we form a collective with this group of young people, the idea felt like an inevitability. We called our first meeting early this summer as soon as we returned from Open Engagement. To provide context we pointed to the rich history of collective action in art, using examples such as ACT UP/Gran Fury (AIDS Coalition to Unleash Power) and the Guerrilla Girls. As a group we decided that our collective would be democratic and we would make all future decisions via a vote. Our first decision was regarding the name of our collective. After much research and deliberation we voted on Bird Closet – a term a member had used earlier that day to refer to a closet in her home in which birds would often become trapped. We collectively decided on the name because of how its absurdity and humor is in tension with the less funny image of a closet for trapped birds. It seemed to embody the playful seriousness of our budding collective. Taking inspiration from the Guerrilla Girls, we decided to remain largely anonymous (by that we mean that as founders of SOIL SERIES, it is impossible for Hillary and I to remain anonymous). At the suggestion of one of the members, our second task was to each choose a bird persona and make a corresponding bird mask to wear when in public. During that first meeting we also decided to create “zines” (short for magazine or fanzine – a self-published work of original or appropriated texts and images, usually reproduced via photocopier), and we voted on the name “Fraxinus,” the scientific name for ash plants. The name references the devastating loss of ash trees in the region to the invasive Emerald Ash Borer. The collages comprising the bulk of this issue take as their source material historical documents, news clippings, photographs, and other items found in the publicly accessible archives of the Bethel Historical Society and Museum. This issue also includes “excavated texts” – poems created by isolating a column of text from an existing document – in this case, Our Appalachia: An Oral History edited by Laurel Shackelford and Bill Weinberg. The isolated text is then used as the lexicon for the eventual poem (see Excavated History of the Pinkham Farm). You can also find copies of Fraxinus scattered around the village. A major part of Bird Closet’s activities this summer is intervening on a billboard at the edge of the village on State Route 125. We have planned to create three successive billboards – the first of which has been up for almost two weeks and will be replaced by the second billboard this week. This first billboard includes an image we encountered while gathering materials for our collages at the Bethel Historical Museum. The robin below was used in the advertising for a “clean up Bethel” campaign in 1966. We were so excited to find out that a bird was used as a sort of beacon for change in Bethel’s history. We are thrilled to announce Bird Closet’s upcoming exhibition at Hillary’s alma mater, Mount Vernon Nazarene University. This is an incredible opportunity for the young people in Bird Closet to share their work with a wide and diverse audience and experience it displayed in a professional gallery setting. We can’t stress enough how incredible this opportunity is and we have been hard at work preparing for install, which will begin in less than three weeks! Unfortunately, our programming so far this summer has eaten up the majority of our funds and as the Bird Closet exhibition approaches we are looking at a number of upcoming expenses. To help raise money for the exhibition we have created a fundraiser on Facebook. You can also help by contributing supplies via our Amazon Wishlist. To become a sustaining supporter of our efforts, consider pledging a monthly donation on our Patreon. You can find other ways to support us on our Support page. Thank you so much for your help and follow us for more updates!